Heating in oxygen-rich atmospheres is a challenging task, which is not simplified by additional requirements like UHV compatibility. 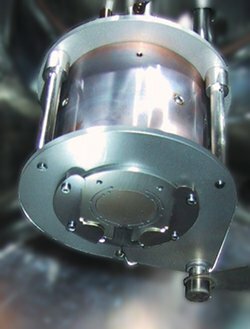 Many standard heater materials are not suitable for UHV conditions due to their vapor pressure. All resistive SURFACE heaters are radiation heaters and are based on a black body design. In combination with specially designed substrate holders this guarantees an excellent homogeneity of the substrate temperature. The heater body is built from pure Al2O3 ceramics. The heat loss is minimized by multiple radiation shields. To obtain high endurance in oxygen as well as in vacuum conditions, Platinum heater wire is used. This guarantees stability in 10 Torr oxygen atmosphere at substrate temperatures of 1000°C (higher pressures up to 760 Torr are possible, but will limit the end temperature reached because of the additional convection cooling). The design and materials used ensure a long lifetime of our heaters. One of our oldest heaters (for 3" diameter) was put into operation at the customer site in 1995 and is still fully operational! The substrate is attached to a carrier with thermally conductive paste (typically silver paste). A thermocouple penetrates the substrate holder, thus getting a precise measurement of the carrier temperature. This is the preferred solution for infrared transparent substrates, because it ensures a good thermal contact of the thermocouple to the carrier and the substrate. Transfer of the carrier with a manipulator is possible, but the substrate rotation range is limited (no continuous rotation). In addition, in some applications the hydrocarbons outgassing from the mounting paste are not acceptable. A thermocouple is located near the backside of the substrate. The substrate is in direct radiation contact with the heater. Continuous substrate rotation is possible, but the substrate has to be opaque in the infrared range to ensure good thermal coupling. Alternatively, backside coating of the substrate might be used. This solution is applicable if all or part of the substrate surface can be covered by a front shield, e.g. if the deposition process can only deposit onto part of the substrate, and homogeneity is maintained by substrate rotation. In this case the front shielding can cover up to 90% of the substrate surface, essentially enclosing the substrate in the heater assembly. In addition, a substrate shutter is integrated, protecting the substrate surface from contamination if no deposition is running, or during process calibration. For heaters with indirect temperature measurement, the measured temperature can be calibrated in connection with our PlumeMaster control software. A stainless steel substrate with integrated thermocouple is loaded into the heater. This thermocouple will measure the exact temperature of the steel substrate. In a calibration run, the software will record the temperature difference between the heater and the substrate thermocouple over the whole temperature range. This correction curve is then applied to future temperature settings and readings. 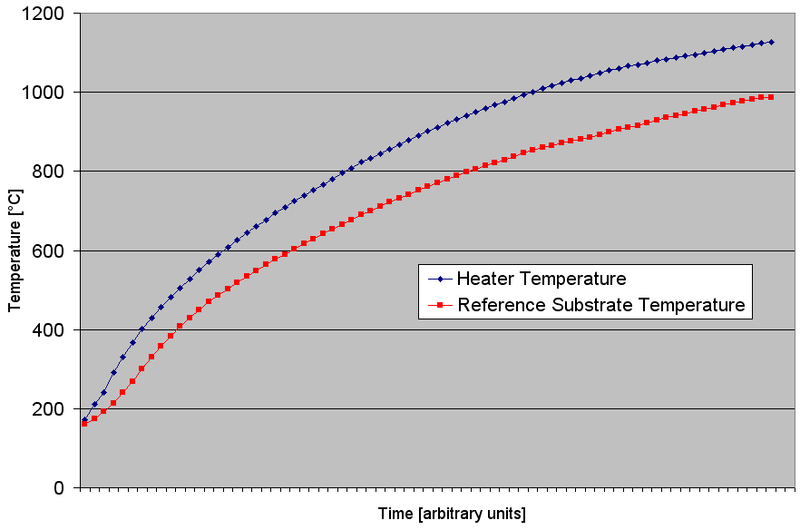 Of course strictly speaking this correction curve depends on the substrate materials, but practically this results in a very good approximation of the true substrate temperature. a) Substrate carrier with clamping mount for 10×10 mm² substrate. 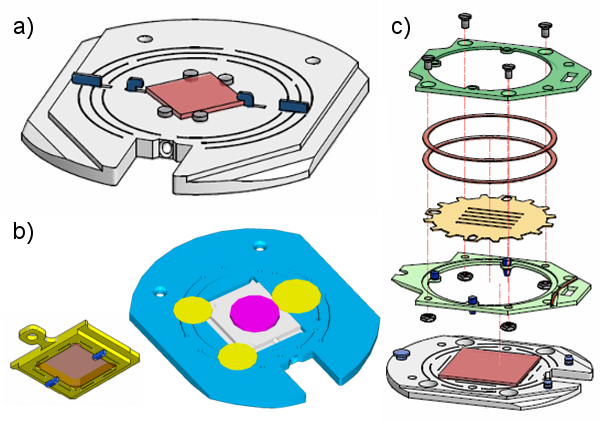 b) Substrate carrier for Omicron AFM/STM sample holder. c) Substrate carrier with deposition mask holder. The deposition mask can be attached/detached to/from the substrate carrier in vacuum. Mask systems which allow to install a deposition mask in front of the sample. Mask transfer systems are available, too, to exchange masks in vacuum! Adapting carriers for omicron sample holders. Together with a transfer station, this enables in-vacuum transfer of samples into scanning probe microscopy systems. Our 2" manipulator can be used with substrates of almost any size up to 2" diameter. 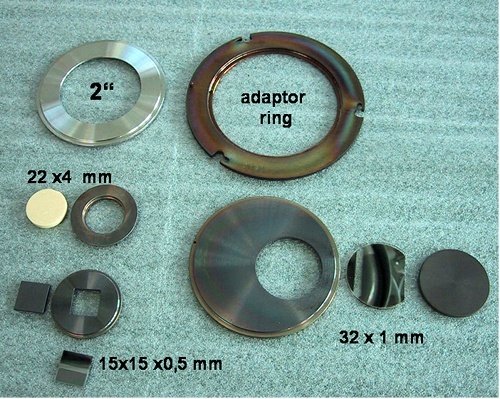 Various adapter solutions are available to mount substrates of different sizes, e.g. 10×10 mm² substrates. In addition, the extra space on the 2" carrier can be used to mount multiple smaller substrates (up to four 10×10 mm² or three 20 mmØ). The substrate rotation feature can then be used to select a substrate for the film growth. 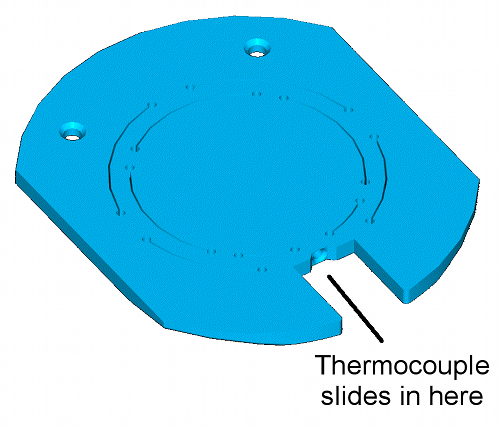 This facilitates sequential deposition processes without any additional heating or loading time. SURFACE provides the heater power supply system. It includes the low voltage power supply and an advanced digital PID loop controller. The specified dimensions are for the heater only, and do not include the manipulator assembly.